Links: Blue Bear, Bear Spirits, Island Weights. 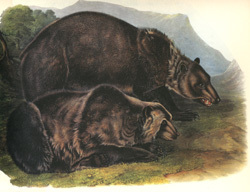 Stories: featuring were-bears as characters: The Were-Grizzly, The Reincarnated Grizzly Bear, The Spotted Grizzly Man, Brass and Red Bear Boy, Partridge's Older Brother, Turtle's Warparty, The Woman who Loved her Half-Brother, The Roaster, Wazųka, Porcupine and His Brothers, The Shaggy Man; mentioning (spirit) bears (other than were-bears): White Bear, Blue Bear, Black Bear, Red Bear, Bear Clan Origin Myth, The Shaggy Man, Bear Offers Himself as Food, Hare Visits His Grandfather Bear, Grandmother Packs the Bear Meat, The Spotted Grizzly Man, Hare Establishes Bear Hunting, The Woman Who Fought the Bear, Brass and Red Bear Boy, Redhorn's Sons, The Meteor Spirit and the Origin of Wampum, The Wolf Clan Origin Myth, Hočąk Clans Origin Myth, The Messengers of Hare, Bird Clan Origin Myth, The Hočąk Migration Myth, Red Man, Hare Recruits Game Animals for Humans, Lifting Up the Bear Heads, Hare Secures the Creation Lodge, The Two Boys, Creation of the World (v. 5), Spear Shaft and Lacrosse, The Brown Squirrel, Snowshoe Strings, Medicine Rite Foundation Myth, East Enters the Medicine Lodge, Lake Winnebago Origin Myth, The Spider's Eyes, Little Priest's Game, Little Priest, How He went out as a Soldier, Morning Star and His Friend (v. 2), How the Thunders Met the Nights, The Race for the Chief's Daughter, Trickster's Tail, Old Man and Wears White Feather, The Warbundle Maker, cf. Fourth Universe. Themes: cannibal were-grizzlies: The Were-Grizzly, The Woman who Loved her Half-Brother, The Roaster, Partridge's Older Brother; friendship between wolves and bears: Wolf Clan Origin Myth. 1 Walter Funmaker, The Winnebago Black Bear Subclan: a Defended Culture (Ph.D. Thesis, University of Minnesota: December, 1986 [MnU-D 86-361]) 49. Informant: One Who Wins of the Winnebago Bear Clan. 2 Paul Radin (ed. ), Crashing Thunder. The Autobiography of an American Indian (New York: Appleton, 1926) 137. Informant: Sam Blowsnake of the Thunderbird Clan. 3 John Blackhawk, "Wazunka," The Wisconsin Archeologist 7, #4 (1926): 223-226. 4 John Harrison, "The Story of Little Priest," Paul Radin, Winnebago Notebooks, Freeman #3892 (Philadelphia: American Philosophical Society) Winnebago III, #11a: 224-241 (= 269-286). Told in June, 1903. Paul Radin, The Winnebago Tribe (Lincoln: University of Nebraska Press, 1990 ) 300-301. 5 Paul Radin, "The Woman who Loved Her Half-Brother," Winnebago Notebooks (Philadelphia: American Philosophical Society) #1: 1-11; Paul Radin, "The Roaster," Winnebago Notebooks (Philadelphia: American Philosophical Society) #2. 6 Paul Radin, "Porcupine" Winnebago Notebooks (Philadelphia: American Philosophical Society) #1: 1-43. 7 Paul Radin, "Turtle's Warparty," Winnebago Notebooks (Philadelphia: American Philosophical Society) Notebook #28: 1-74. 8 Paul Radin, "The Hairy Man," Winnebago Notebooks (Philadelphia: American Philosophical Society) #9: 1-89. 9 Robert Eisler, Man into Wolf (Santa Barbara: Ross-Erickson, 1978 ) 13. 10 Paul Barber, Vampires, Burial, and Death (New Haven: Yale University Press, 1988).